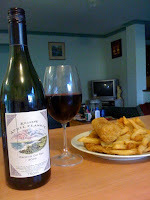 Fish and chips from the local Wellington Village Fish Shop, washed down with a half bottle of Ben Killery's delightful 2006 Premium Dry Red. Aaaah the simple pleasures of life. But the Eagles aren't going so well... let's watch New Tricks. This guy wins $181 million in the lottery on a Wednesday, and then finds the love of his life just 2 days later. A new Fortune Small Business/Zogby Poll has found that a little less than half of small business owners say that they have been affected by the recession. What is really remarkable to me about these results is that if you listen to the media, every business in the US is on the brink of disaster. The fact that 57% have not been damaged gives us hope that the entrepreneurial engine we need to pull us out of the recession is ready to grow when the time is right. This sounds right from what our customers are saying. So they would dig up coffins and would take the bones to a bone-house, and reuse the grave. When reopening these coffins, 1 out of 25 coffins were found to have scratch marks on the inside and they realized they had been burying people alive. So they would tie a string on the wrist of the corpse, lead it through the coffin and up through the ground and tie it to a bell. Someone would have to sit out in the graveyard all night (the graveyard shift.) to listen for the bell; thus, someone could be, saved by the bell. Or was considered a.. dead ringer..